Take your dog with you on planes, in hotels, to the beach, or in restaurants, without the endless hassle! Want to know how to make your dog a service dog or emotional support animal? Registration alone is not a substitute for training, but registration and ID tags from USA Service Dogs help instantly identify your service dog or emotional support animal, easing any hassle commonly experienced while travelling on airplanes, trains or to hotels. We understand that your dog is not just a pet, but an important and trusted companion in your daily life, and that not all disabilities are readily apparent. When you register your service dog and display our ID cards, you can help end the hassle and questioning once and for all by letting others know that your dog is essential to living your life. We hope that you use our official registration service responsibly and for the purpose with which it is intended. We are not required to verify your disability and do not ask you to submit medical documentation in order to register your service animal for privacy reasons. This is a powerful service that changes lives every day. Sample Official ID cards from USA Service Dogs help identify your service dog or emotional support animal for easy access to beaches, parks, hotels, and airlines. Our ID cards are durable and double-sided with federal laws conveniently listed on the back, and come with free plastic cases for extra protection. Even businesses that post signs prohibiting pets, or in places where local laws would prevent you from bringing your pet, you are still allowed under federal law to bring your service dog with you into the business premises at no extra fee. This includes airline cabins and housing units that may have pet policies prohibiting dogs. The FHA accommodates those with emotional support animals into housing units with accompanying letter from a medical professional. Carriers shall permit dogs and other service animals used by individuals with disabilities to accompany the person on a flight. (1) Carriers shall accept as evidence that an animal is a service animal identification cards, other written documentation, presence of harnesses or markings on harnesses, tags or the credible verbal assurances of the qualified individual with disabilities using the animal. (2) Carriers shall permit a service animal to accompany a qualified individual with disabilities in any seat in which the person sits, unless the animal obstructs an aisle or other area that must remain unobstructed in order to facilitate an emergency evacuation. Any dog breed is acceptable! The law does not distinguish based on the breed or size of dog - any dog can be a service or emotional support animal! Emotional support dogs do not need specialized raining while service dogs may be trained in their task by professionals or their owners. The ADA takes precedence over local laws or business policies, so you can travel with your service dog knowing that your rights are protected in all 50 states. 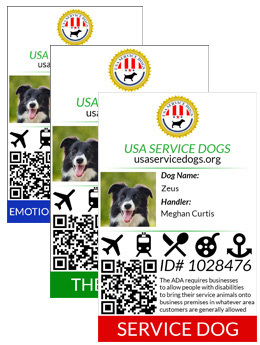 While displaying registration ID cards, tags, or vests is not required by the ADA, many people find that having them helps instantly identify their service dog or emotional support animal, alleviating the hassle of constant questioning about the service dog or emotional support animal. Additionally, while technically against the ADA guidelines, many businesses still ask to see some form of documentation if you plan on bringing a service dog onto business premises. 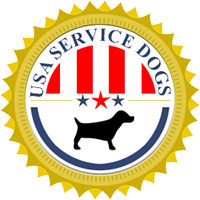 Service Dog Certification Helps Disabled Vets! We recognize that not all disabilities are visible. Many veterans returning from war may suffer from post-traumatic stress disorder (PTSD) and require a canine companion. Unfortunately, it may not be obvious to business owners that a person may be suffering from something like PTSD. That's why it's important to carry service dog certification documentation - the last thing a veteran needs after fighting for our freedom overseas is to be harassed about his service animal in a public place. Other conditions that qualify for emotional support dogs include anxiety disorders, panic attacks, social phobias, fear of flying, among many others. Emotional support dogs are there for companionship and are not required to be trained in a specific task, other than offering you unconditional love. 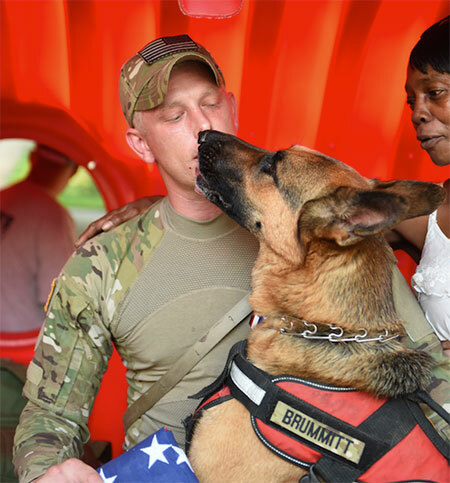 Your registration helps support service dogs for veterans! We proudly donate a portion of our proceeds to Paws for Veterans, a phenomenal organization which rescues dogs from shelters and unites them with our heroes returning from war who may suffer from PTSD. Please watch their inspiring video below. We offer instant electronic (printable) ID cards, physical ID cards, service dog vests, service dog tags, service dog leashes, and registration certificates in convenient kits for all your needs. Your satisfaction is our top priority. We're proud to offer a money-back guarantee that you'll be happy with our service. End the hassle now. Register today. With instant printable ID cards from USA Service Dogs, you can be on your way in as little as 5 minutes to an easier life with your service, emotional support, or therapy dog. 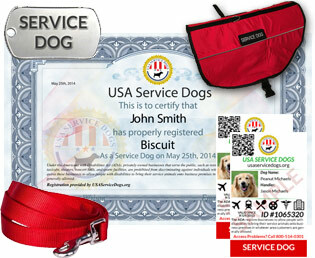 Registration at USA Service Dogs never expires and is good for the lifetime of your service dog. Express shipping of vests, certificates, and physical ID cards is available. We also offer physical ID cards and identifiable vests, tags, and leashes to ensure a hassle free experience bringing your dog with you in public. Questions? We're here to help. Send us an email at orders@usaservicedogs.org and we'll get back to you sooner than you think! Copyright ©2012-2019 USA Service Dogs. All rights reserved. USA Service Dogs uses industry standard 256-bit encryption to secure the data you send to us including personal information accompanying your registration as well as payment information. We do not store credit numbers anywhere on our servers, they are used once only at the time the transaction occurs. We collect your e-mail address only to send you order confirmation emails, registration information, and occasional news and updates about our service. We do not sell or give any of your information, including your e-mail address, to any third party organizations. USA Service Dogs is an organization providing service dog and emotional support animal registration services and products independent of any government organization. Read about fake service dog registrations and the problems they create. Registration not required by the ADA. *Sample letters are for informational and convenience purposes and may need to be filled out by a licensed mental health professional or physician. We do not fill out medical documentation for you.